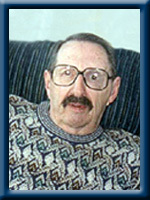 Wallace, Stanley Arthur, 83, of Liverpool, Queens County, passed away on Friday, September 30th, 2011, peacefully at home. Born in Cochrane, Ontario he was a son of the late Ian and Peggy Wallace. Stanley was a former member of the merchant marines and, in 1946, sailed on the Liverpool Rover on its last trip from Liverpool to China, a six month journey. Following this he moved to Toronto, where he worked for 35 years for C.N. and Go Transit, until retiring in 1984 and moving back to Nova Scotia. He and his wife Midge spent 17 years in Greenfield before moving to Liverpool in 2001. Stanley was a former member of the Patterson Lodge # 265 A.F.& A.M., and Royal Arch Masons #218, both of Toronto as well as the Brampton Flying Club and the Canadian Merchant Navy Veterans Association. He was a prized gardener, model railroader and an avid painter. He is survived by his loving wife of 58 years, Ruth “Midge” (Forbes); sister Pat Westwood, of Maple Ridge, B.C. ; brother Denis (Joan), of Burlington, Ontario; many nieces and nephews. He was predeceased by brothers Victor and Donald “Skee”. Dear Midge, So sorry about Stan’s passing. He was a great guy! I always enjoyed meeting up with you both and having a little chat. You are in my thoughts during this sad time. TO RUTH -SO VERY SORRY TO HEAR OF STAN’S PASSING!! !MY THOUGHTS ARE WITH YOU AT THIS DIFFICULT TIME! I’m sorry to hear of Stan’s passing. Dear Midge, We are so sorry for the lost of your husband Stan. We will be praying for you and the family. We will miss seeing him at the Supperstore this year.Take care. Sorry to hear this. I will include you in our prayers. If you would like a visit please contact me at 354-2152. Sorry to read of Stan’s passing.I always enjoyed our chats at the grocery store and I was forever grateful when you made the angels for the Gift Shop. It was a shock when you called yesterday to tell me the sad news. Our hearts go out to you and the family. It was always a great time when I had the chance to drop in and see you both. Last going off, when Stan wasn’t getting around much, he still kept his spirit up no matter what he faced. He looked back at his life with pride but was still modest about his accomplishments. Midge, he always mentioned about the great care you gave him and that he thought he would keep you. His sense of humor never faltered. He always spoke highly of his family and the pride he had in their acomplishments. The Christmas that we had brought our girls over for a visit, will always be a great memory. Stan will be greatly missed and will forever be in our hearts. I was very saddened to hear of Stanley’s passing. i will miss seeing his friendly face at the store. My thoughts are with you. So very sorry to hear of Stan’s passing. Our thoughts and prayers are with you at this sad time. I just finished reading Stanley obituary. I am so sorry for your loss. I know you loved one another deeply and that doesn’t happen very often. At least he is without pain now and I will fondly remember him. He was the highlight of my day when I worked at the Superstore. He always had a kind word and a smile for me. If there is anything that I can do for you do not hesitate to contact me at my email address or 354-4928. Again my most heartfelt sympathy.